CYP AU-D3 DAC review | What Hi-Fi? Products don't get much smaller or more straightforward than this CYP DAC. Simply feed an optical or coaxial signal into the tiny box and an analogue signal emerges from the stereo RCA connections. 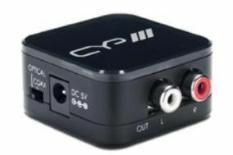 Given the price, it's no surprise that the CYP has its limits, and the internal DAC of a half-decent CD player or AV receiver will produce better results. However, if you're running a budget Blu-ray or DVD player, or a Sky HD box, into a stereo amp, this is a neat and affordable way to coax out far more punch, detail and dynamics.